As you know, I’m in my last semester of nursing school and to say it’s a little bit stressful is a complete understatement. One of the things that makes this class difficult is the extensive clinicals that are required. I love that our school includes clinicals within all of our classes, but the clinicals for this class are a bit more involved than the other classes. Because we live in a rural area, we often have to travel quite long distances to clinicals. Our school also does an awesome job at giving us experiences that we might not normally get. One of our opportunities is to go to Des Moines (about 3 hours away) for three days to do clinicals at a large hospital there. We also get to do a one day rotation in home health, OR/ER, and various simulations in our simulation lab. Otherwise, twice a week, we are in our assigned clinical location. Mine just happened to be about an hour and 15 minutes from my house, which isn’t horrible, but it’s the farthest location that I could have been assigned to. We also have to be there ready to go on the floor at 6:00 in the morning, which means that I have to leave my house no later than 4:30 to be there, which makes for some pretty early mornings. Lucky for me though, one of my best friends was assigned the same location so we have been able to carpool together which has made the drive considerably more tolerable. Yesterday was our last day of clinic for this semester. While I have enjoyed clinicals and learning more about my profession, I was really glad to be done and be able to focus on the classroom part of this semester. When I woke up, it was pretty foggy so after picking my friend up, I decided to take a little different course becasue the roads we would be on would be more straight. In Iowa, the deer are in rut–meaning that it is their mating season, so they are out everywhere! I regularly see 2 or 3 on my way to school, but since I was 16, I’ve been lucky enough not to hit any. Yesterday morning, my luck apparently ran out. On our way to clinic, about 45 minutes from my house, I saw a deer and the minute I saw it, I knew I was going to hit it–And I was right! After I hit it, I was extremely surprised that my car kept going with no apparent injuries to the car that impaired it’s driveability. I knew I was okay and could see that my friend was as well..except the minor heart attack we both may have had. We pulled over after a few miles or driving in shock to a well lit area to check out the damage. I also called the sherrif’s office and my insurance company to report it. A while back, when working at a job I didn’t enjoy, mom told me that I needed to turn everything into a learning opportunity…I guess this is no different–I now will know how to file an insurance claim! I got a call from the adjustor today and have to try and get it into an autobody place for an estimate and will eventually get it fixed. As crappy as it is, this is what insurance is for. And as long as no one got hurt, that’s the important thing! This entry was posted in Uncategorized on November 16, 2016 by Kelli. sorry that happened to you. It’s scary and frustrating to deal with the aftermath. I’m glad you weren’t hurt. The deer are in the rut down in Texas right now too. They are so crazy! Oh, no! Glad you and your friend are O.K. 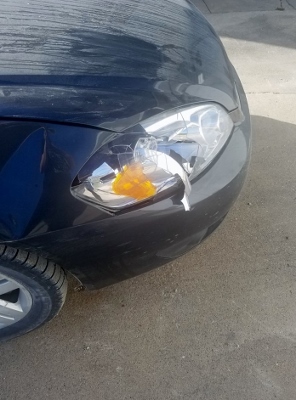 1) Vehicles can be fixed, people can’t-so glad you are ok.
2) You don’t hit the deer-the deer hits you. Thank you for preparing to help people who are injured. So glad that you and your classmate are safe and okay. You can fix the car and yes it will be a learning experience with the insurance company, hope it goes well. Nice to hear that you are getting the opportunity to have so many diverse clinicals as part of your schooling. So after knowing all people and car are ok for the moment …. what about the deer ? I mean this in the kindest way if it were hurt it seems someone needs to put it down . And venison in the freezer is good to carry you through the winter. I had a small sports car (Triumph) years and years ago and a deer crossed the road in front of me acutually bounded right over the hood of the car niked her hooves as she went. Yep, those sweet deer are running blindly with love leading them. Texas is no different than any other place ….today in a 13 mile stretch of four lane highway I counted eight that had been hit. I also saw where someone laid down a long stretch of rubber and still landed in the median. The deer was there too. Be safe…this too shall pass. Hi Kelli-I’m glad you’re okay. You’ve worked hard for your nursing degree. Congratulations!! 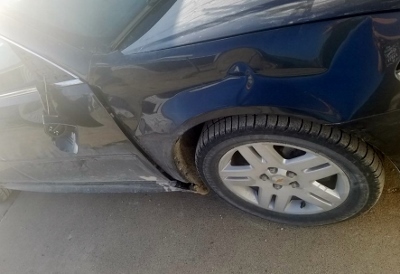 A deer hit my sister’s car two weeks ago. Over $4,000 worth of damage to the car. People ok, deer not so much. Glad you are okay. I used to live in an area where there were deer and elk and have always felt fortunate that I never hit any with my car. That must have been so scary for you.